You’ll get more color accuracy, better consistency and it saves you time. There is only one reasons I can imagine to ever have White Balance in Auto. You are only taking one exposure in certain light source and don’t have a white balance card. I leave my camera in the white balance that best guesses an accurate WB from my main light. This is usually cloudy . I leave my WB alone for all the shots. If I have my camera bag with me then I shoot a picture of my Color Checker Passport. Take pictures not worrying about WB. In post I fix one for WB so the skin looks right. I fix the WB of one picture only, usually one in the middle of my set. If I had the color checker then I use it’s grey. 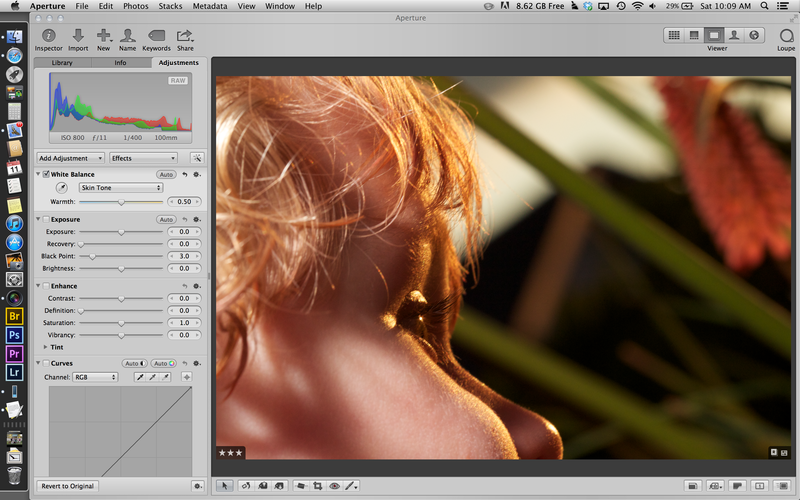 If I didn’t have the color checker I take a reading using Aperture 3.3’s new skin tone dropper. In Adobe Camera RAW (ACR), Lightroom (LR) of Photoshop (PS) I use this technique. It’s called the CYM % rule. It’s based on the fact that each caucasians skin has the same ratios of CYM. Different ethnicities do also, just with a slightly different formula. It saves you time while shooting since you don’t have to worry about the color of the light and continually change you WB. You’ll get more color accuracy or consistency. The camera doesn’t know what the subject is. This matters most when varying color light may be present in a setting but only one color on the subject. Spend the time you would have on all the pictures with varying color getting one just right and then make them all the same. When making artistic changes I like to see the Kelvin scale since I learned color shooting in a studio and taught my brain to see in Kelvin. 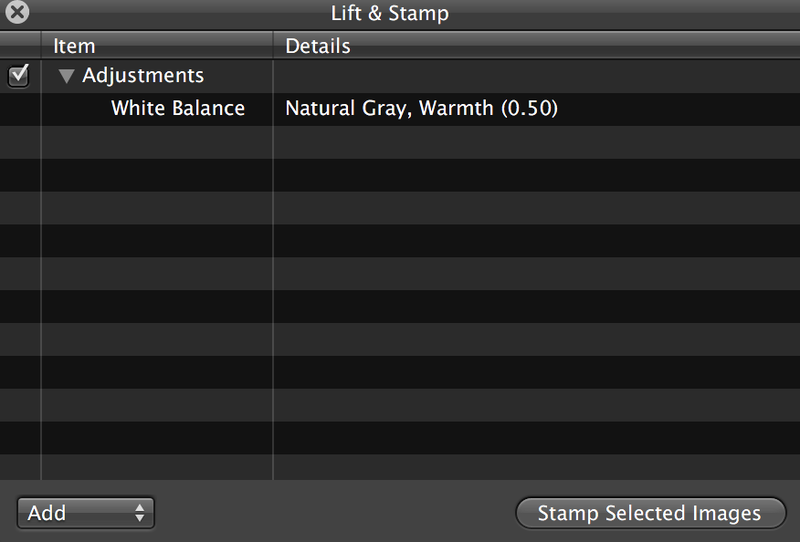 In Aperture the Kelvin scale is available by changing the drop down to “Temperature and Tint”. Does a warm or cool color convey more of the vision you had when you framed the shot in your mind? Does it communicate better your message? You’ll still save time since you only have to do it once, pushing this correction out to the others. Here’s a couple tips for using the grey card. Make sure you hold the card at the correct angle so that the light that will later hit your subject it hitting the card in the same way. During post use it for your neutral grey. This gives you an accurate color. This is like a scientist sitting next to you saying, ok here is the actual color. As an artist feel free to tweak (As I mention above). I find my artist vision is more precise when I start from a true color, I think you may as well. Please don’t think these this neutral grey trick works by simply finding something white in the photo. You won’t get an accurate color by clicking on a white T-Shirt or cloud or wall. I’ve tried with usual disastrous results. Starting with RAW is best but not by much. It’s absolutely true that RAW captures more color. It’s also true that if you shoot in RAW a benefit is that the color space isn’t chosen. That being said it doesn’t help that much in getting a better color. This thought process is from the old days when changing the color was only possible if you shoot in RAW and use Adobe Camera RAW (ACR). That is no longer true. No modern photo editing software imposes that limitation. OK so how about the negatives of leaving WB out of auto and don’t touch it? It’s possible that in cloudy by shooting something very red you may clip out the highlights more readily than if it was properly balanced. The effect would be more pronounced in red light. So lets say for instance you were shooting a red tulip field during the magic hour you may very well lose some information during capture. This is kind of a perfect storm scenario and not very likely. I look at the 3 color histogram of all my photos in after shooting and I’ve never noticed it. Of course this means you’re a little safer from losing data when capturing blue. I would agree that manual white balance is great for controlled situations where you are shooting the same scene for a period of time but as a wedding photographer almost every other photo is of a different scene. Photographing the bride getting her hair fixed by the window, then all of a sudden a bridesmaid is helping another, this time under incandescent light – kick the ISO to 3200 and shoot, then the bride’s father is getting his flower pinned on but there isn’t enough light in that room, flash has to go on. If I had to manually white balance all of these scenes I would miss a lot of moments. Thanks to RAW I can shoot in Auto WB and fix in post. Now when we are doing family formals in a controlled setting, the WB gets manually set and everything is nice and easy like you mention. I just think there are some scenarios where getting the shot/moment is more important than setting the proper WB. Hey, I didn’t agree at first but you may have a convert. Answer me this. If you shoot 4 of dad by the window in auto and spin around and shoot 4 of bride by the lights. Then in post you notice the WB for the window is a little too blue. You sync it to the other 3 by the window and then spend time adjusting it to your preference. Will that adjustment bump the WB by the same amount on the other three or set it to the same final value? It sets them all to the same, but you wouldn’t select them all to adjust the WB unless they were close and similar in the first place in which case I feel it doesn’t matter too much if they are a few points off. I’ve never seen auto WB throw the same scene that much unless you do a hugely different zoom or crop of a photo. It’s not for everybody or every situation but for shooting fast on weddings manual WB would really slow me down. Well I found taking it out of auto saved me time. I wonder if I should give AWB another try. There’s no logical reason, if it sets them all to the same value, that AWB wouldn’t save me time. Thanks for the comment! I love being wrong because it gets me to be a better photographer. I know plenty of photographers who shoot in manual WB. I think I would just see what works for different scenarios and more importantly you. I don’t think you are “wrong” at all, it’s just what I found works for me.